In last article, we have define the independent testing. Now in this article, we will understand the quality of software. Quality of software can be described with bug fee or defect free software. Software can be fulfilled with all requirements and needs to be delivered on time. This point is also covered on software quality. Even ISO 8402-1986 standard have been define quality of software as all features and characteristics of software should be satisfied as per implementation and need of client. Some aspects have been define as quality of software. Lets understand all the points in details. 1. Design of Software: Design Or look and fill is the main aspect of accepting any application and software. If design is not proper for understand the application then its hard for client to accept that product. As per the requirements, design of the product should be created. Color combination, text styles and button design should be placed as per the requirements and all button should be work as per the description. For example, Delete button should be able to delete the selected record. 2. Functionality of Software: Product is looking perfect but what if its functionality is not working properly then client will not satisfied with product delivery. All feature and functionality of the product should be worked as per the requirements. It should not happen that actual and expected result will be came in different way. For example, Application should not accept the password which does not have any special characters or numbers. If any user enters normal password for the login procedure then software should displayed them a validation message that Password will not be accepted by the software as it does not have special character and numeric value. 3. 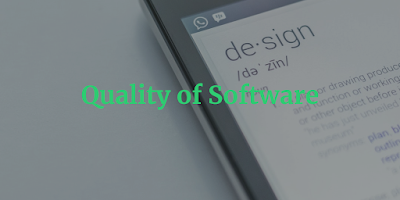 Acceptability of Software: First of all we have verified design and functionality of the product but it is very important that product is reliable. For example, if we have clicked on delete button and it is working properly for 100 records only and we have selected 1000 records for deleting. 900 record is still remaining to delete from the page and application got hanged then this product is not acceptable by client. Thus, product should be work as per the requirements. 4. Behaviour of the Software: Behaviour of the product should same at all the level. If a product have more then one page or levels then application should behave properly at every page or level. Application should maintain the consistency. Even software should be durable for more years. If application have more than 10000 records in a year then it should not stop working for next year. It should work as it worked on last year and any functionality of the software should not be broken. Thus, Behaviour of the product should be work as expected. 5. Sales Service of Software: We have build the software as per the client’s needs but now maintenance is required by them. Our product or software have been shipped already but now all the improvement and changes have been demanded by the end user. Thus, to keep our client satisfied, we need to give them good sales service of maintenance. For example, any improvement have been asked by client then it is our humble duty to provide them fast service for the product which have been already developed by our organization. Here, we need to be sure that all the improvement have been delivered with quality. New improvement should not affect to the old functionality of software. On time delivery will be made client happy and he would like maintain relation with the organization. 6. Worth of Money: What ever the product or software have been delivered to the client, it must have some value of their money. The product or software must have that all the functionality which ever client have demanded. Design of the product, behaviour of the product should be created as per the requirement of the client. Delivered software or product should be work as expected. It should not be hanged often. Our product and software should should work friendly . We should provide good service to our clients. All the requirements, functionality and additional improvements should be work as expected and additional improvements from the organization may give him worth of money. Client will be satisfied with our service if we will provide him more rather then what he asked for. This is all about the Quality of Software. Here we have completed first chapter of ISTQB examination. Next articleautomated testing – Cucumber : Is it necessary to create multiple step defination class for single feature with multiple scenarios?